The Florence Melton Adult School of Jewish Learning in Johannesburg offers a uniquely constructed adult Jewish education program which spans a two-year curriculum and provides a basic foundation of Jewish knowledge. The teaching is sequential, interactive, text-based, dynamic, and pluralistic. The program provides a Jewish journey of learning and growth which strengthens students’ connections to Jewish heritage, culture, and community. As students learn more about Jewish heritage and history, they also become more effective advocates for Israel. Rhythms of Jewish Living introduces students to ideas, beliefs, and practices which have shaped Jewish life. The course includes daily, weekly, annual, and life cycle rhythms in Jewish life. Purposes of Jewish Living addresses beliefs and practices of Judaism, as they arose from the Jewish historical experience. A unifying idea which links all beliefs and practices is the development of the covenant and the contractual relationship with G-d. The course includes Biblical and Rabbinic texts. Dramas of Jewish Living Through the Ages studies Jewish history as a tool to strengthen Jewish memory and Jewish identity. The course includes the Biblical period; the Second Temple-Rabbinic period; the Middle Ages; and modern times. Ethics of Jewish Living examines foundations of Jewish ethical thinking in the Torah and Rabbinic literature. The course also examines cases in Jewish law where these concepts have been applied in the decision making process. 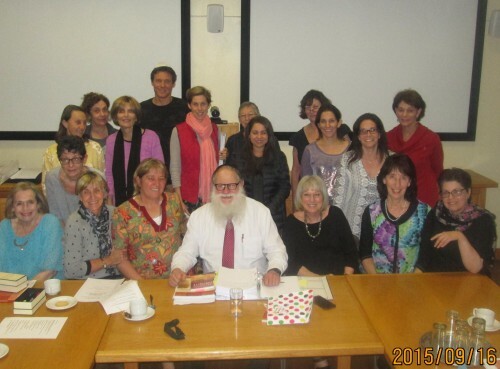 Israeli Literature as a Window to Israeli Society, a Melton graduate course, also was taught in 2014. An additional graduate course, The Holocaust as Reflected in Diaries and Memoirs, will soon be added to the program.